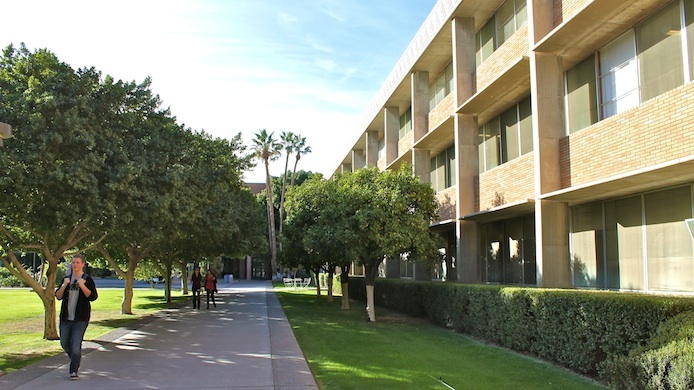 The Center for Nanotechnology in Society at ASU (CNS-ASU) is the largest center for research, education and outreach on the societal aspects of nanotechnology in the world. CNS-ASU develops programs that integrate academic and societal concerns in order to better understand how to govern new technologies, from their birth in the laboratory to their entrance into the mainstream. Research the societal implications of nanotechnology and emerging technologies. Train an interdisciplinary community of scholars with new insights into the societal dimensions of emerging technologies. Engage the public, policy-makers, business leaders and researchers in dialogues about the goals and implications of emerging technologies. Partner with cutting-edge laboratories to cultivate greater reflexiveness in research, development, education and policy. The guiding conceptual goals of CNS-ASU are two-fold: to increase reflexivity within nanotechnology research and to increase society’s capacity to engage in anticipatory governance of nanotechnology and other emerging technologies. All governing requires some orientation toward the future. We cannot predict the outcomes nanoscience, but we can deliberate about futures using tools ranging from scenarios and models to games and science fiction. From large-scale workshops to informal settings, CNS-ASU designs and tests new forms of public engagement to generate opportunities for true dialogues about emerging science and technology. Integrating societal perspectives into laboratory work increases the opportunity for informed scientific practice. CNS-ASU helps scientists develop a greater capacity to understand where scientific and social values come from, and how they may be related to research about emerging science and technology. Societal outcomes require "intellectual fusion" across disciplines. Knowledge from across the academic spectrum is necessary to comprehend the complexity of the real world, as is knowledge from the general public.